Welcome to the digital playbill for your youtube streaming of James Wylder's Cryptos! We hope you enjoy the play, so sit down with some popcorn and gather round the monitor! On this page you can find everything you'd want from a playbill, including the Director and Writer's thoughts from the 2011 production, the cast and crew, pictures behind the scenes and youtube videos that go beyond the play giving you even more detail about the world of "Cryptos". So sit back, relax, and enjoy the show whenever you're ready! Brought To You by the Generous Support of Backers on Kickstarter! ! If you enjoyed this presentation, please consider backing the Kickstarter as your "Ticket"! You can even get a copy of the play in print with your contribution with cover art by Olivia Hinkel. A pledge of $10 will get you a digital copy, and a pledge of $15 will get you a handsome paperback. Even a $1 contribution helps tremendously. 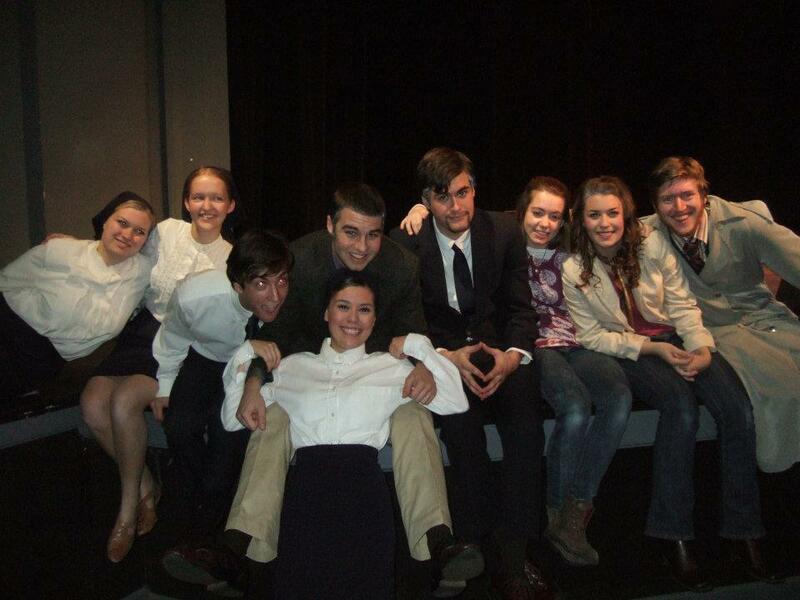 Read An article from "The Madison Courier" about the 2011 production! Read blogger Kylie Miller's thoughts about the 2011 Production of Cryptos! Jim Wylder appeared on our Hanover College theatre scene a few years ago when he took my screenwriting course, in which he displayed a unique writer's voice, weird sense of humor, and a real writer's discipline in completing a 120-page project in one semester. He later took my playwriting and advanced playwriting courses and began acting in our productions. Jim's dramatic world is pleasingly strange, his stories unpredictable yet inevitable. His heroes are questing for the good, but like us they are deeply flawed and introspective. Jim brings out the monster-hunter in all of us. When I was a child, my friends and I used to play pretend as monsters and hunters. It was always fun to be the monster, stumnling around making (what you think are) frightening noises while your friends hit you with toy lightsabers. But it was also fun to figure out what the monster was. Why is it here? What makes it unique? It wasn't until I was older that I understood monsters weren't the stories we tell, but the very people we know. It was the realization that all those stories of Devils and Darkness were euphemisms for the bad things that are really in the world. I began to connect them all together, and we got the play you'll be watching tonight -- a lifelong fascination with the ludicrousness of cults, Cryptozoology, and my own Christianity filtered through the world's shadows. I would like to thank Mark Fearnow for everything he has done to get this play mad,e and make it better than it would have been otherwise, as well as all of the magnificent cast and crew, and everyone in the HC Theatre department who made this show a reality and made it look better on the stage than it did on the page. You humble me with your excellence. Here's to many more mysteries. Explore Cryptos on Youtube further! Get a recap of the play from Kayla Snabl ("Growler"), learn about the production of the play the four-part retrospective "Cryptos Talkin'" with author James Wylder and Kayla, and see them perform the Cultists rhyme together! Also, see a new series of videos of Gray Shierholt reprising his role as Adric Ramses to perform his monologues from Cryptos!